Chicken Egg Foo Young | Four Ingredients! If You Love Eggs And You Love Pancakes, this Recipe is for You! Chicken Egg Foo Young is a recipe I discovered several months ago when my mom and I ordered Chinese take-out. I was skeptical of the dish until it actually arrived and I got a good look at it. It was a fried egg pancake filled with chicken and veggies, and it was darn good! I can’t believe I had gone all my non-Keto life without knowing this existed. Just because I’m keto now doesn’t mean I can’t enjoy it. 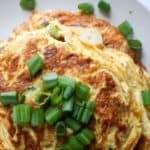 I have created this Chicken Egg Foo young for anyone and everyone who loves eggs, loves pancakes, and wants a quick and easy Asian recipe to make! Be sure to watch our Chicken Egg Foo Young recipe video shown above if you have questions on any of the steps in the recipe. I wanted to recreate this recipe because it is the perfect take-out recipe to remake for a keto diet. All it takes is any three, four, five or more ingredients you want or have in your house. I kept it simple and went with the following four ingredients: Eggs, chicken, broccoli and soy sauce. If you’re skeptical about the combination of savory ingredients and soy sauce with eggs, don’t be! I was at first, but after my first bite of this incredible savory pancake, I was sold. Don’t worry, there is still one more recipe from my Asian inspired weekend coming your way and it is going to impress you and your taste buds! Can you guess what it is? It’s probably the most requested recipe we have gotten so far, so I wanted to take my time and be sure to produce a truly exceptional variation on it. Mix four eggs and set aside. Heat skillet to medium-high heat and add 1 tbsp of coconut oil. Add cut up chicken thigh and heat until fully cooked through. Add broccoli and onion to cooked chicken and cook for additional 3-5 minutes. Add chicken, onion and broccoli to eggs. Add garlic powder, soy sauce, salt and pepper. Add second tbsp of coconut oil to heated pan. Using a 1/3 measuring cup scoop out some of the egg, chicken and broccoli mixture and pour into the pan. Using a spatula push egg mixture towards center of pan making a smaller circle. Cook for 2-3 minutes and flip. Cook for another 2 minutes. Repeat until all mixture is used. Serve warm and enjoy!